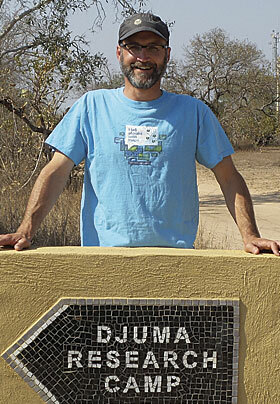 Math and engineering teacher Marcel Duhaime poses in his Esri T-shirt behind a sign pointing to the Djuma Research Camp in northeastern South Africa. Students and teachers from Hopkinton Middle High School and Bow High School in New Hampshire recently spent three weeks in the area helping to install ArcGIS for Desktop at Acorn to Oaks Comprehensive High School. In addition to teaching 30 South African students how to make and analyze maps of their area, the visitors got a chance to enjoy the sights while on safari. Tom McConnell, who calls himself an ancient GIS guru, wears a similarly antediluvian Esri T-shirt while meeting with GIS students Auliantya Ayurin Putri (left) and Rosita Andari Eka Putri (right) from Gadjah Mada University in Yogyakarta, Indonesia. 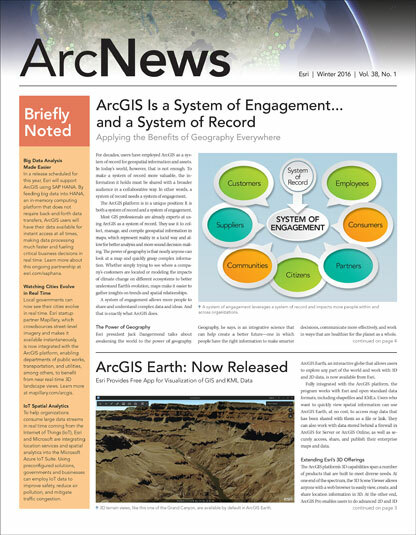 McConnell met Auliantya Putri at the 2015 Esri User Conference in San Diego, California, where she received the 2015 Esri Young Scholars Award for her ArcGIS Online service-based applica-tion that allows people to report poor conditions at and around schools. 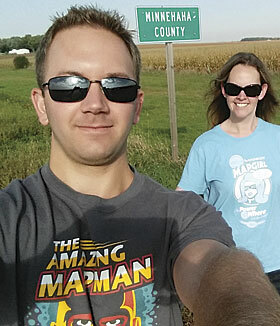 The Amazing Mapman and The Magnificent Mapgirl were spotted recently in South Dakota. Minnehaha County GIS analyst Josh Hellman and GIS coordinator Heidi Jerke were using Collector for ArcGIS to do some fieldwork at the county line.